Who loves a good movie night? What about a good snack? What is your favorite genre? Action, romance, comedy?? What about snacks? Sweet?? Salty? Both? I actually like them all. I am big fan of Si-Fi and fantasy, but I also really like a lot of romance movies. So when I got to do a post that not only let me watch a good romance/tear-jerker AND make a yummy snack for movie watching I was right on that. They had a lot of great titles I knew I would enjoy like Forest Gump and I am Legend, but since I had never seen The Notebook (and I think if you are a woman that you are required to see it..lol) I decided on that one. 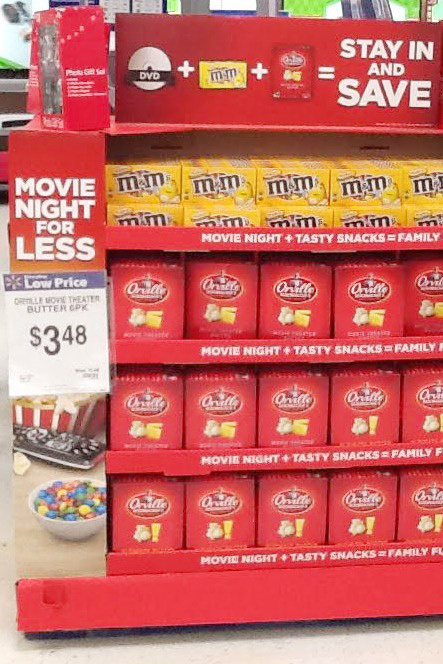 While I was there I also snagged a couple of packs of M&M’s® in the theater size boxes and Orville Redenbacher’s popcorn to make a yummy and simple snack to eat in between the tears. It’s a sticky M&M’s® Candy Popcorn. It really was super good AND super easy. It took me about 10 minutes to prepare it (not including cooling time). This snack can be prepared in a couple of ways. I just spread it out on a greased cookie sheet and then put in a bowl to serve. But you could also form it into popcorn balls or press into a greased 13 x 9 x 2-inch pan coated with cooking spray or butter (then cut into squares). 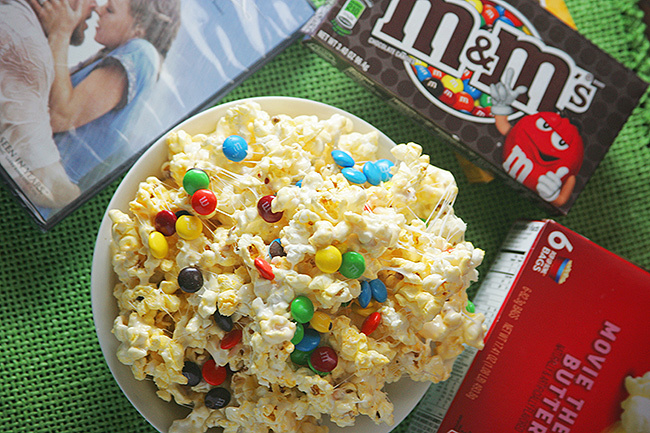 Hope you enjoy it for your next #MovieNight4Less! Follow Orville Redenbacher’s popcorn on Facebook, Twitter and Instagram . Follow M&M’s® on Facebook, Twitter, and Instagram. Follow Warner Brothers on Facebook and Twitter. Prepare a large cookie sheet with aluminum foil and spray with cooking spray or coat with butter. Pop Orville Redenbacher popcorn according to package directions. Open and set aside. In large saucepan melt unsalted butter over low heat. Add mini marshmallows and stir until completely melted. Add Orville Redenbacher popcorn . Stir gently until well coated. Remove popcorn with a greased spatula and pour onto greased cookie sheet. Spread out over the sheet. Cool for 30 seconds to one minute and sprinkle Plain M&M’s® Candy on top of mixture. 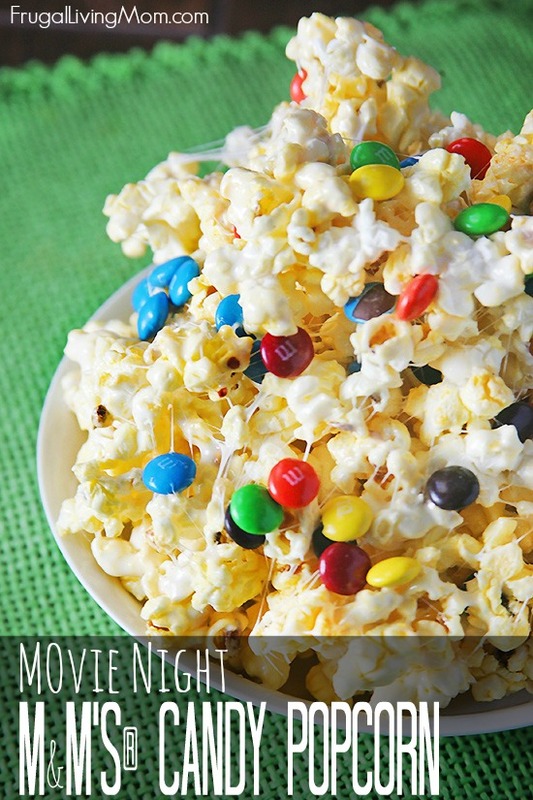 Continue cooling the M&M's® Candy Popcorn and then serve. Best when eaten the same day.